In Resident Evil 2 Remake, there are some hidden collectibles and useful items to find, some of which you will need to unlock the Platinum Trophy (100%). 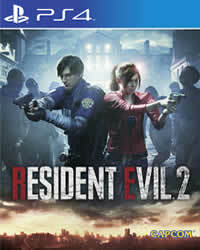 More Guides and News about Resident Evil 2 you will find on our overview page or visit our 100% Walkthrough. In total there are 6 Pouch (Inventory Upgrades) hidden in the game. Pouch #1 1F West Office Inside the safe in the small office. Input the code 9-15-7 to unlock it. Pouch #3 Underground Facility, Operator’s Room In the locker, next to the typewriter. Pouch #4 1F Safety Deposit Room This requires 2 Spare Parts that you found inside the Portable Safes (Here you will find all Safe codes and locations). Place the missing Spare Parts on the broken Keypad and enter number 203 to open the locker with the Inventory Upgrade. Pouch #5 Sewers Workroom Lift Use the T-Bar to raise the shutter, then ride the lift up. The pouch is located in the room above. Pouch #6 Laboratory Nap Room Restore power to the Nap Room, and you’ll find the Pouch in the bunk to the back-right.